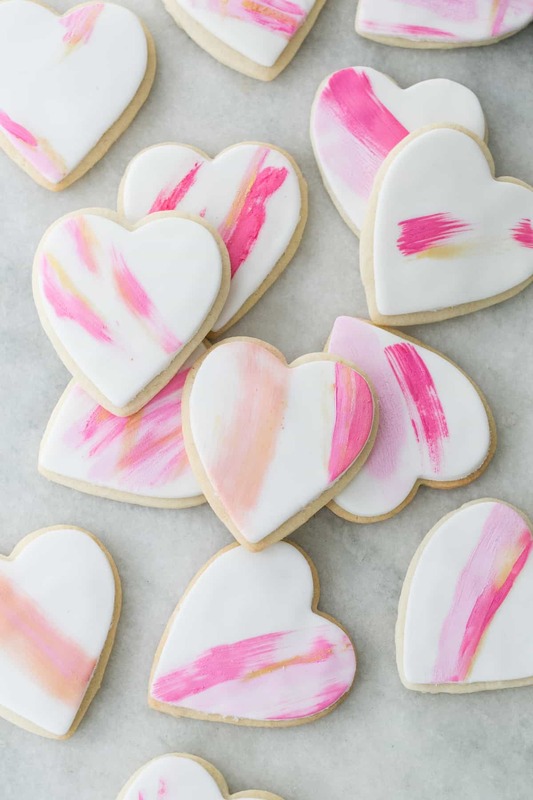 How charming are these easy brushstroke sugar cookies for Valentine’s Day?! 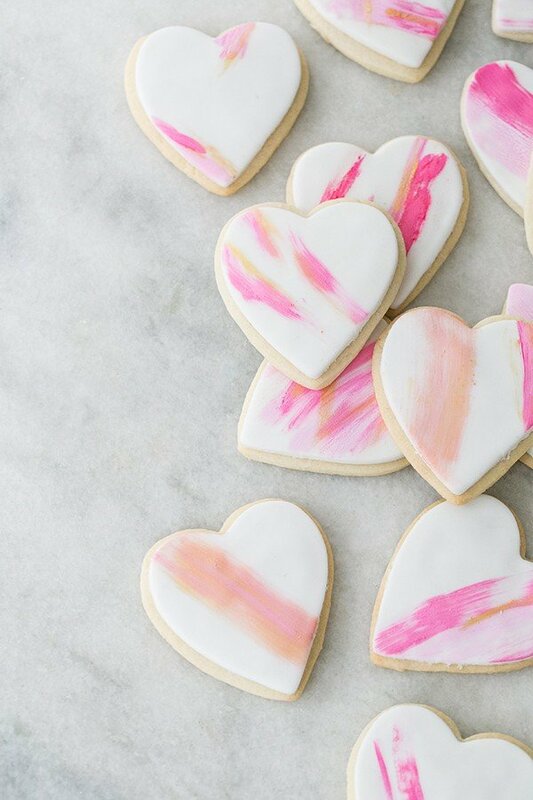 They use the classic sugar cookie recipe with a fondant topping and then they’re brushed lightly with a gel paste! 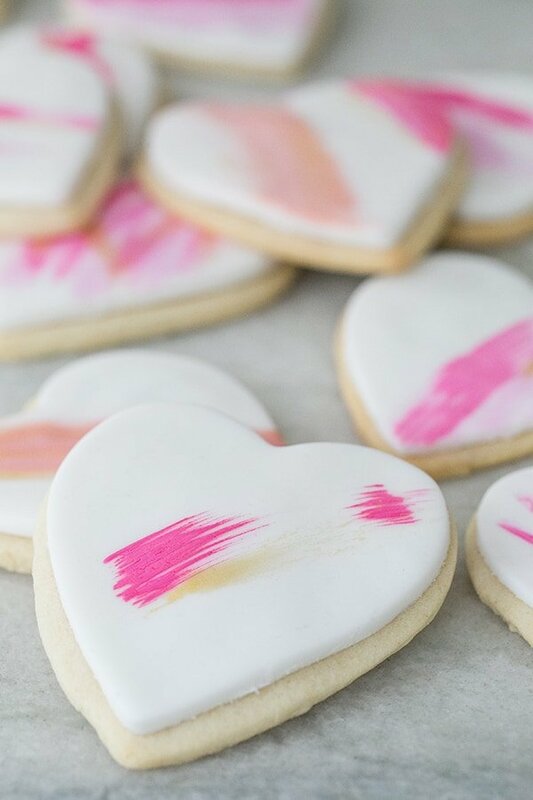 Incredibly simple to make and even more fun to decorate… we broke out some brushes and felt very artistic creating brush strokes with food coloring! 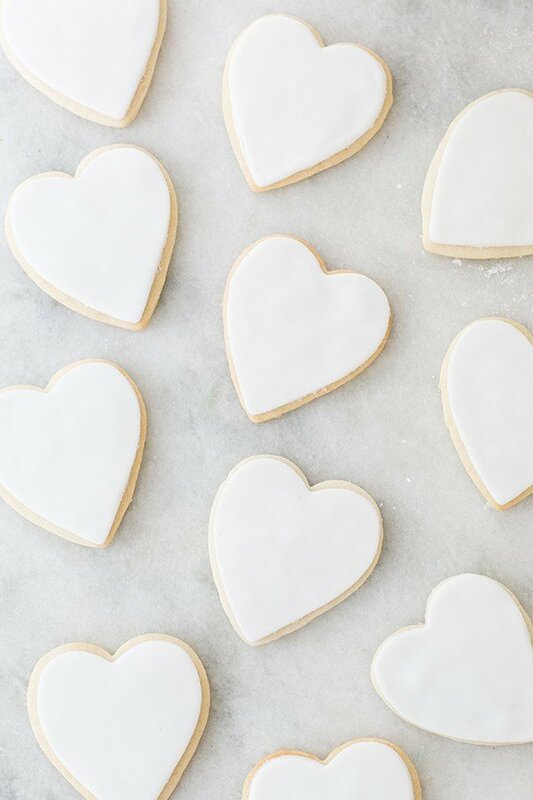 If you’re not a fan of fondant, you can do a royal icing that hardens too. We used the same heart-shaped cookie cutter to make the hearts and to cut out the fondant. Try to roll out the fondant to be a very thin layer. Add a little bit of butter cream frosting on the cookie before you lay the fondant over it. This will allow the fondant to stick to the cookie. Preheat the oven to 375 degrees, and line baking sheets with parchment. Cream the butter and sugar, just until smooth and combined. Mix in the eggs until incorporated one at a time. Add the flour, cornstarch, and salt, and mix on medium low speed, until the dough gathers itself into a ball and pulls away cleanly from the sides of the bowl. Roll each section of the dough ¼ inch thick between two sheets of parchment paper. Refrigerate while you do the next section of dough. When all three parts are finished, take one part of the dough out of the fridge, remove top sheet of parchment and cut out shapes. Roll second section, cut out and combine remaining dough from first section, roll back out between parchment, refrigerate and continue on with 3rd section. Cool completely, then roll and cut out fondant hearts. 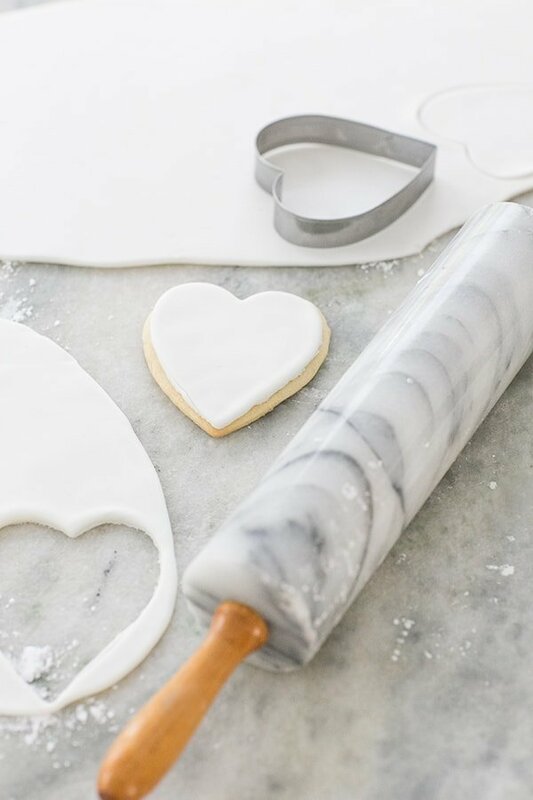 Spread a small layer of buttercream frosting on each cookie and place the fondant on top. 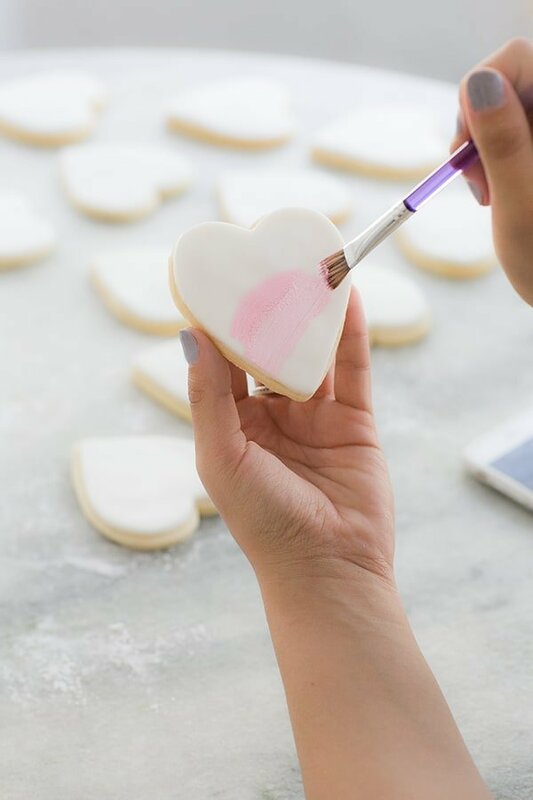 Use cake decorating brushes to make brush strokes onto the white fondant. Mix and match colors and use gold dust for another charming touch! i love the hint of color! the pink really pops out against the white (: i normally don’t use fondant, but seems worth the extra effort since these look so nice. Yeah, to be honest I’m not that fond of it either, but it really is such an easy way to decorate a cookie! There is frosting under it, so I guess you could just take it off to eat, haha!! I might dry this with royal icing one day and see how it turns out.